M. Night Shyamalan spent quite a few years making bad movies, after first emerging as one of the brightest young talents in the industry with his early efforts like The Sixth Sense and Unbreakable. Now, largely thanks to his movie Split, which was a critical and financial success, not to mention a secret sequel of sorts to Unbreakable that many had been wanting for quite some time, he's back on track. He's set to return to that world once more with Glass and according to one of the producers, it's going to be a Shyamalan take on a superhero movie. But a very different kind. Jason Blum, head of Blumhouse Productions, recently spoke with Collider in order to promote The Horrors of Blumhouse maze, which is going to be part of Universal's Halloween Horror Nights this year. During the conversation, Blum was asked whether or not he would describe the Split sequel as a superhero movie. Here's what he had to say about it. "Of course, it's a kind of superhero movie, for sure. I do consider it that, yeah. It's very different. I would say it's not a Marvel movie, but a superhero movie." Unbreakable was released in 2000 and that was ahead of the curve in terms of Hollywood's current obsession with comic book movies. But Unbreakable was very much a superhero movie of sorts, even though it didn't come from the world of Marvel or DC. So giving M. Night Shyamalan the chance to revisit the genre, in his own, different way, with Glass, is a very exciting prospect. Especially considering how unexpectedly good Split was. There's also going to be a lot of interest, as Split made a very impressive $276.9 million at the box office, making it one of the most unexpected hits of 2017. That also makes it one of the most profitable, since the movie cost a mere $9 million to make. Though, we suspect Blumhouse may up the budget a bit for Glass. Glass will pick up following the conclusion of Split and finds David Dunn (Bruce Willis) pursuing Kevin Wendell Crumb (James McAvoy), aka the superhuman figure known as The Beast, in a series of escalating encounters. Meanwhile, the shadowy presence of Elijah Price (Samuel L. Jackson), aka Mr. Glass, emerges as an orchestrator who holds secrets critical to both men. 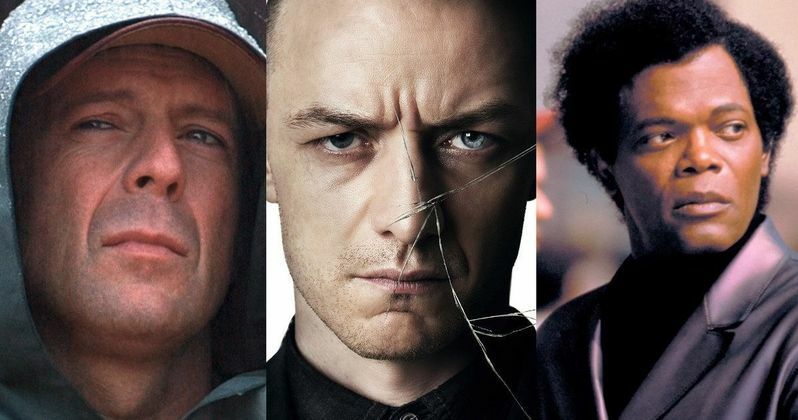 Glass is going to bring together all of the best elements from both Unbreakable and Split for what sounds like a great, if non-traditional, superhero showdown. Anya Taylor-Joy also returns in Glass as Casey Cooke, with American Horror Story star Sarah Paulson recently signing up for the sequel as well. Production on the highly-anticipated sequel is set to begin this month, with a January 18, 2019, release date set. Avengers 4 be damned, Glass could wind up being the best superhero movie of 2019.